Blog Students Win Listowel Writers' Week Literary Competitions! Wonderful news for my students from the Listowel Writers’ Week Writing competitions! I’m so proud and excited! Sadhbh Cushen has won joint second place in the nine years and under category. 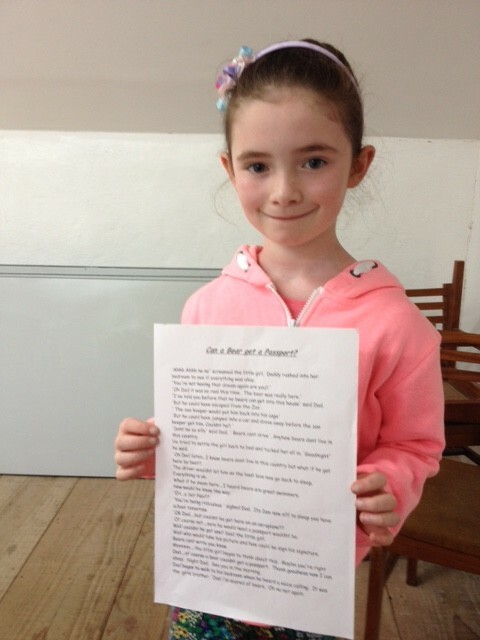 Sadhbh attends classes in Skerries and wrote a very funny story (told mostly through dialogue) about a child who doesn’t want to go to sleep. She shares this prize with Grace Lenny, who is doing an online writing course with me. Grace wrote a wonderful poem inspired by the Diary of Anne Frank. Not only that, Hannah Rudden (for her SECOND TIME!) has come first in her category, this time for fourteen years and under, with a story about Autumn. And Sean Geoghegan (age 12) has won first place in the Young Sports Journalist Award (for age group 12 to 21 years!) with his excellent essay on the Paralympics. Yipeee! We’ll have to hire a ‘Megan Wynne School of Creative Writing’ bus to bring all these winners to the Listowel Writers’ Week Awards ceremony on the June Bank Holiday weekend!